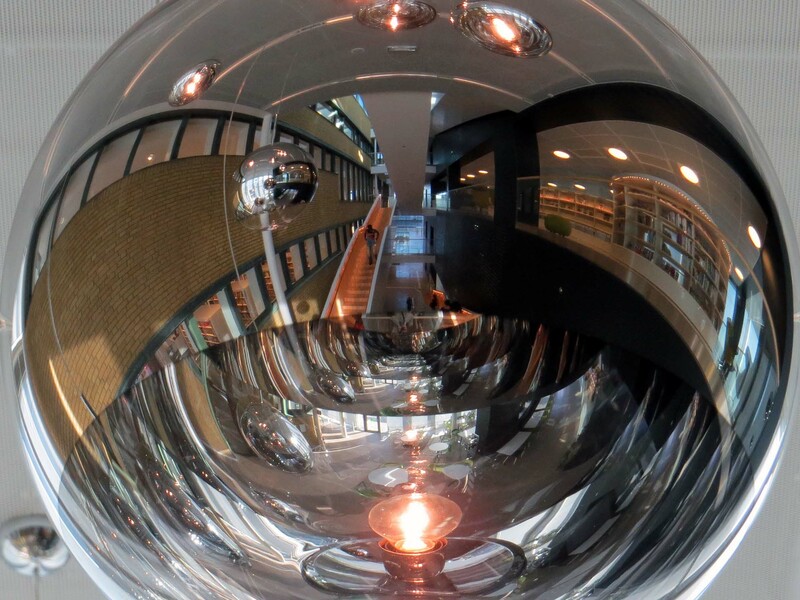 Planet library, this week’s photo, shows part of the new wing of Gothenburg City Library reflected in one of the half-mirrored lights hanging over the stairwell. I originally published this on 28th April 2014, a day after I photographed it. Between 2012 and 2014 the city carried out a renovation and extension that cost SEK 240 million. That’s about €25 million at the present rate of exchange. The library officially re-opened on World Book Day (23rd April), a few days before I took this photo. Gothenburg is served by a number of really good libraries. The city library has a number of branches out in the different parts of the city – usually attacjhed to schools. But as a consequence of shutting down for the renovation, the city opened a number of temporary libraries in available spaces around the centre. These proved so popular that they continue to serve Gothenburgers three years after the main library re-opened. The new spaces that were added to the city library include a lecture hall and exhibition space, a children’s area and a café. The library appears to make very full use of the physical space as well as being active on-line with a website and blog and a presence on Facebook, Instagram etc. Towards to end of GBG365 my daily postings included a number of photos from and around the new library buildings. There’s no English language Wikipedia page for the library, which is a bit of a surprise to me. However, here’s the Swedish language entry.